Aeropostale, online at Aeropostale.com, is your online destination for casual clothes and accessories for teenagers and preteens. At Aeropostale, you can find graphic tees, tank tops, jeans, shirts, and hoodies. Aeropostale also sells sweaters, leggings, shorts, capris, dresses, and skirts. Boxers, sunglasses, belts, headphones, watches, bags, wallets, and cologne are available at Aeropostale as well. 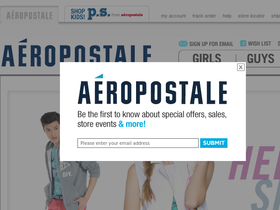 In addition, you can get gift cards and online gift certificates at Aeropostale. Be sure to check RetailSteal.com first for Aeropostale coupons, Aeropostale discounts, and Aeropostale promotions. The price of shipping your order at Aeropostale depends on the price of the order and its shipping destination. See website for full details. Exclusions may apply. Act now and enjoy 20% off your highest priced item with this coupon code from Aeropostale.com. Get up to 80% off your order at the Clearance Sale online at Aeropostale.com. Click link and save now. Shop online and enjoy up to 50% off the entire site online at Aeropostale.com. Check out the uniform selection online at Aeropostale.com and enjoy up to 60% off uniforms. Shop at Aeropostale and enjoy 15% savings on your order of 5+ uniform items. Click here to shop. Shop at Aeropostale and enjoy graphic tees starting at $5.99. Click here to shop. Get 50% off girls' shorts at Aeropostale. Click link to buy now. At Aeropostale, get 50% off all shorts for guys you buy online. Click link and shop now. Shop at Aeropostale and enjoy 85% savings on tops. Click here to shop. Check out OldNavy.com for their latest special offers. Shop at oldnavy.gap.com and get 3 options for huge savings when using this promo code at checkout. Save 20% sitewide with no minimum spend, or save 25% when you spend $75+, or save 30% when you spend $100+. Click here for code. Shop at Gap.com and earn GapCash on purchases. Spend $50, earn $25 GapCash. Spend $100, earn $50 GapCash. Spend $150, earn $75 GapCash. Limited time only so hurry over to Gap to save.